There was a time when a homeowner’s contribution to improving the windows in a home was limited to style and design. Not so long ago, the phrases ‘home improvement’ and ‘energy efficiency’ could not fit in one sentence because there was little a homeowner could do to improve how well a home could conserve heating and cooling energy. The advancement in the home energy conservation, which is an industry on its own now, means that homeowners are on the forefront of optimizing their homes in more ways than you probably know. If you are a homeowner, you can now determine how much you want to save on the costs of heating and cooling your home by simply making the right choice when it comes to fitting new windows in your home. No matter what type of home you have, you can never be too choosy when it comes to selecting the right frame for your windows. There is a wide variety of window frame materials on the market, each with different heat transfer capability. If energy conservation is your primary objective, then you would obviously choose a wooden frame over an aluminum or steel one because metals are very good conductors of heat. This, however, does not mean wood is your only, or the best, option. Vinyl is an excellent frame material that also happens to be cheaper, easy to shape and construct, and is even better in conserving energy compared to wood. If you are old-school and would rather stick to wood, perhaps a wood-clad frame that brings the best of both worlds — a low maintenance beautiful vinyl exterior encasing an interior wood that is temperature transfer resistant wood. A large surface area of your home window is covered by glass. The material that the window is constructed from is most important when considering how best to conserve energy in the house. 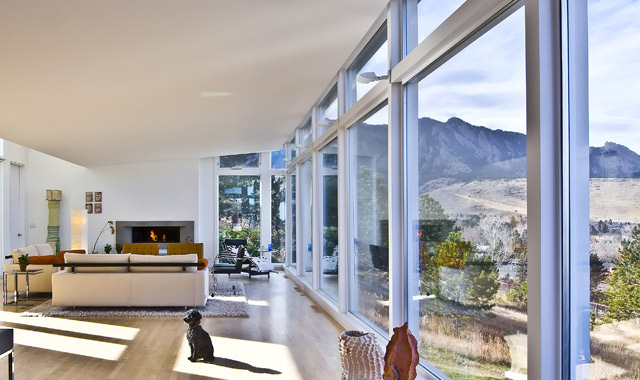 You could choose a single-pane insulated glass if you are on a tight budget, or you could find a vacuum-sealed double-pane window that guarantees maximum energy conservation. The choice is yours. The rule of thumb is to first determine how much energy you are looking to save, and working with the size and number of your windows, determine the best type of glass that will save you a lot of money in the long-run. The most popular types of energy-efficient glass you will find in the market today are triple-paned glass and high density insulated glass. You can determine the energy efficiency of glass by the standardized manufacturer U-value, which is the glass’ unit measure of heat loss resistance, and SHGC (Solar Heat Gain Coefficient) which is the measure of how much heat the glass will let into the house. In both metrics, the lower the rating the better the glass. For most homeowners, a window design is almost wholly determined by their aesthetic preferences. Once you appreciate the fact that some window designs are inherently better in energy conservation compared to others, you will be inspired to compromise on your aesthetic preferences if it means cutting your energy bills by hundreds of dollars by the end of the year. The most common window design, the double-hung with the bottom that slides up to open, is among the most energy efficient and minimalist. However, it may not be the right one if you live in a place with extreme climates. Casement window designs are popular in climates where harsh winds are a problem but seals and hinges leak energy and may require quite a bit of investment in maintenance to keep them stable and efficient. You must never overlook the importance of proper installation. You could invest hundreds, even thousands, of dollars in the most energy-efficient windows but they will only be as good as they are installed. A professional installer will ensure that the windows fit snugly and no small openings will let heat escape or get in. This must be done without over-relying on sealants and expanding foams. Besides, no one is better suited to advise you on whether you made the right choice than an experienced energy efficiency window installation contractor. Can you add some more detail? Your reasoning should be accepted and normal for all…it’s just that..There are a few nuances that support this. I hope so- ty for your consideration. Your content comes across a bit hurried-you are often very detailed with your lines of thinking. Your research is awesome. You have done a great job. You have written a very useful article about energy efficient windows.